World War I was the most devastatingly transitional conflict in human history. Military technologies completely outraced military tactics, causing horses to go up against tanks, French soldiers in flamboyant red trousers and blue coats to march in Napoleonic formations into machine gun fire and modern artillery, and machinery to eviscerate man in ways that weren’t thought possible. 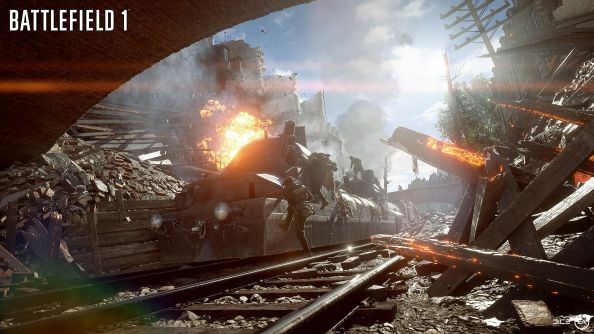 Here’s the details on Battlefield 1’s release date and everything else we know. It was disorienting and chaotic, taking place in trenches, and fields that looked like the surface of the moon, with nary a building in sight – a very stark contrast to the tight, urban combat we associate with the Battlefield series. 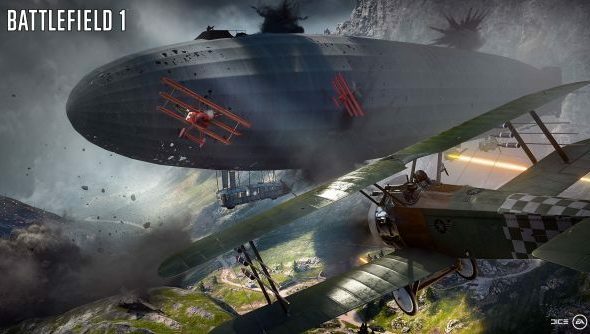 My main question going into a hands-on with the game was, would EA Dice mould the WWI scenario to familiar Battlefield mechanics, or would they adapt the decidedly ‘modern’ Battlefield formula to this most unconventional of conflicts? 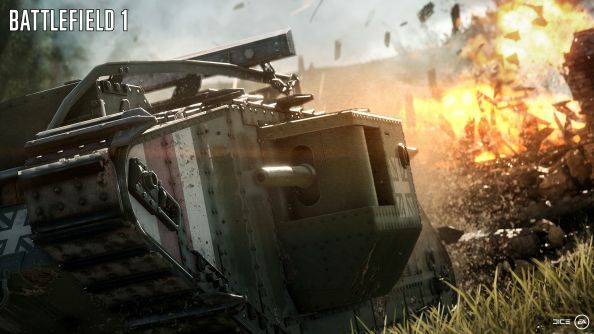 The hands-on kicked off with 15-minute trailer showing off the new maps, classes (dedicated pilots and tank officers, who can instantly spawn in their respective vehicles at certain checkpoints), as well as familiar Battlefield traits – squad-spawning and how Conquest works (surely everyone knows by now?) – albeit framed in such a way that they sounded like new features. The most intriguing new feature for me were the zeppelins, or ‘behemoths’, which are player-controlled and can swiftly level entire villages while several players defend them from harrying biplanes using the onboard machine guns. While the preamble was as impressive as you’d expect one for Battlefield to be, it all looked a lot more vivid and colourful than the common perception we have of the war. The grass is as green as a low-lying Alpine village (minus the cows), the skies were searing blue, and even the fires looked alluringly glowing. It was almost as if to confirm, nice and early, that this is far more a ‘Battlefield’ fantasy of WWI than a down-and-dirty recreation of it. With the schpiel over, I jump into the a 64-player Conquest game on a map called St Quentin Scar. Contrary to some of the bright Arabian deserts and alpine villages that were depicted in the trailers, this map is all WWI – a shelled-out Battlefield littered with barbed wire, mountains of rubble, and skeletons of vehicles. It was described as a combination of trench warfare with battling through an ‘untouched’ village (though it was definitely touched by several rockets and artillery strikes by the time I got there). I have the option to jump in as a tank officer in a landship or assault class, and decide – bravely or foolishly – to go assault so I can experience the carnage in the most pure, vulnerable state possible. A mistake on my part, as I need to sprint for a good minute before seeing my first piece of action. At least the jog highlighted for me that there’s a definite downturn of pace from the Battlefield 4. Everything feels more weighty, rickety and cumbersome, which feels perfectly appropriate for a war that could reasonably be described as ‘clunky’. My first melee in a village doesn’t go well, as I quickly get disorientated by the smoke and dust caused by an enemy landship’s shelling (obviously, not everyone shared my philosophy that the first game should be played as infantry class – cowards). I don’t last long courtesy of an rocket shell that crashes through the wall of a house I was but I enjoy these early minutes – it feels heavier and the setting feels fresh, supplemented by the grinding, creaking acoustics of rudimentary military hardware. With that said, the average gamer might have trouble distinguishing the settings and weaponry from the WWII shooters that defined the early noughties. On my second leap into the fray, I decide to embrace the vehicles, acting as an effective chauffeur in a blocky armoured car with a trigger-happy machine gunner up top. As I storm around the map capturing checkpoints, I appreciate the volatile driving conditions; fires, rubble and broken roads filled with ramshackle barriers often make bits seem impassable, and yet it’s designed in such a way that I felt like like a seasoned WWI driver as I weaved amidst obstacles, evaded tank shells, and dropped my buddies off at precious capture points, jumping out to pick up a few kills of my own using my odd machine gun that, as many guns of the time seemed to be, extended as much vertically as it did horizontally. The game seemed to be turning in our favour after a shaky start, but then the opposing team spawned themselves a zeppelin. True to all the buildup in the trailers, it was a majestic and formidable sight – especially when you know that it’s completely player-controlled and not constricted to rails like the infamous AT-ATs of Star Wars Battlefront. Back on foot, I ran up to an enemy checkpoint that we seemed on the brink of taking, when the two friendly tanks around me went up in flames. It was the behemoth, and the collateral from its destruction of my pals damn near killed me too. I hunkered down, said a little prayer, and eventually it glided off, presumably in search of buildings and vehicles to destroy than puny little infantry like me. Fittingly, the dynamic weather conditions kicked in around this point, turning the skies from a grim grey to suffocating fog, which I can only imagine worked to our advantage as it covered us from the mechanised beast overhead. After some near-death encounters in the ruins of a bombed-out church, where soldiers are hard to pick out against the collapsed ceiling beams, I jumped in as a secondary gunner on a landship. It was joyous. The small, thudding rockets I fired were almost all direct hits, eviscerating three soldiers as we captured a couple of control points. We were dominating the game, controlling nearly all points on the map, though things went out with a bang as the fog cleared and that accursed zeppelin destroyed me and my driver. It made no difference to the course of the game, which we’d all but sealed by that point, but a poignant send-off reminding me that these things are powerful enough to add a welcome new layer to the battles. 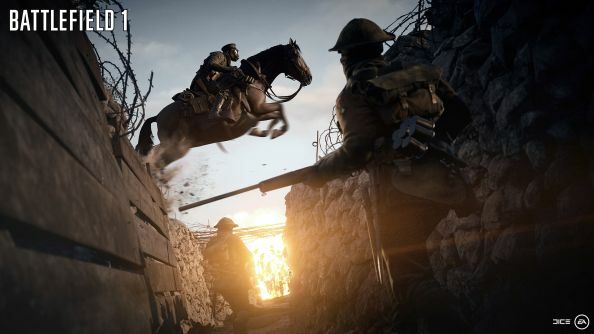 Unfortunately, there were no horses to ride on this map, nor any opportunity for me to bayonet-charge anyone, but in my short, sweet time with Battlefield 1 it feels like a much-needed stylistic twist on the classic formula, while the mechanics go back to the slower, more methodical gameplay of the pre-Battlefield 4 days. The sample of Battlefield 1 I played was more crunchy, clangy, yet completely faithful to the team-based, explosive spirit of the series.. The zeppelin wildcard was fantastic to behold, and it’ll be fascinating to see how other distinctly WWI traits like cavalry charges, mustard gas and, errr, shovel-cudgelling, will be implemented. This could be just the refresh needed for the stalwart series.